Callum McManaman booked Wigan's Championship play-off place and left Birmingham on the brink of relegation. The midfielder took advantage of some lax defending in the third minute to curl in his fourth goal of the season. Birmingham's fifth defeat in a row extended their run without a home league win to 18 games - which stretches back to 1 October. Lee Clark's side remain third from bottom, and will drop into League One if they lose at Bolton on Saturday. Even a victory will not be enough to secure survival for the 2011 League Cup winners if other results go against them. Losing FA Cup semi-finalists Wigan had been limping towards the play-offs after successive defeats against Burnley and Blackpool. But they made a fast start at St Andrew's as Jordi Gomez surged through the home defence and played the ball left to McManaman, who took a couple of paces forward before curling his low right-footed shot past keeper Darren Randolph. Clark's side could have drawn level after 29 minutes, but Scott Carson denied them with a stunning save. Birmingham captain Chris Burke's blocked volley dropped on the right-hand edge of the penalty area for Emyr Huws, whose curling shot looked destined for the top corner until Carson somehow palmed it away. Clark sent on 6ft 8in striker Nikola Zigic at half-time but he struggled to find a way past Wigan's impressive central defensive pairing of captain Emerson Boyce and Gary Caldwell. When he did find an opening in the 69th minute, meeting a cross from right-back Paul Caddis, his weak header from six yards was comfortably dealt with by Carson. The Wigan goalkeeper came to the rescue twice in a frantic finish - first diving bravely at the feet of Federico Macheda to deflect his shot away for a corner, before diving low to his right to cling on to a drive from Hayden Mullins. "It's not good enough for us, for me or the players, but most importantly not good enough for the fans. They're the ones I'm feeling for. "It's imperative we get a result on Saturday. Our away form has been very good. But like I've said many times, the players need to walk the walk when they get out on the grass and deliver what's got to be delivered." "Overall the achievement from when I came in on 9 December has been fantastic. "The effort the players have put in is monumental to get to 73 points in such a short time. "We're not over excited, we're keeping calm and we know what we want to achieve but we've achieved the first hurdle, though there are more hurdles to come." Match ends, Birmingham City 0, Wigan Athletic 1. Second Half ends, Birmingham City 0, Wigan Athletic 1. Attempt saved. Hayden Mullins (Birmingham City) right footed shot from the centre of the box is saved in the bottom left corner. Foul by Nicky Maynard (Wigan Athletic). Jordi Gómez (Wigan Athletic) wins a free kick on the left wing. Foul by Emyr Huws (Birmingham City). 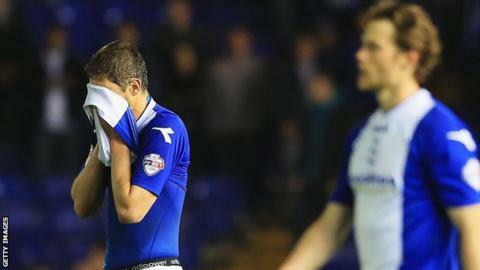 Nikola Zigic (Birmingham City) is shown the yellow card. Robert Kiernan (Wigan Athletic) wins a free kick in the defensive half. Andrew Shinnie (Birmingham City) wins a free kick in the attacking half. Substitution, Wigan Athletic. Leon Barnett replaces Shaun Maloney. Emyr Huws (Birmingham City) wins a free kick in the defensive half. Foul by Jonathan Spector (Birmingham City). Attempt saved. Emyr Huws (Birmingham City) left footed shot from outside the box is saved in the top left corner. Foul by Gary Caldwell (Wigan Athletic). Nikola Zigic (Birmingham City) wins a free kick in the attacking half. Corner, Birmingham City. Conceded by Scott Carson. Attempt saved. Federico Macheda (Birmingham City) right footed shot from the centre of the box is saved in the bottom right corner. Assisted by Nikola Zigic with a headed pass. Chris Burke (Birmingham City) wins a free kick on the left wing. Corner, Birmingham City. Conceded by Jordi Gómez. Substitution, Wigan Athletic. Nicky Maynard replaces Callum McManaman. Substitution, Birmingham City. Andrew Shinnie replaces Tom Adeyemi. Corner, Wigan Athletic. Conceded by Jordon Ibe. Tom Adeyemi (Birmingham City) is shown the yellow card for a bad foul. James McArthur (Wigan Athletic) wins a free kick in the attacking half. Foul by Tom Adeyemi (Birmingham City). Attempt saved. James McArthur (Wigan Athletic) left footed shot from outside the box is saved in the top left corner. Assisted by Jordi Gómez. Corner, Wigan Athletic. Conceded by Mitch Hancox. Attempt missed. Emyr Huws (Birmingham City) left footed shot from outside the box is just a bit too high. Foul by Jean Beausejour (Wigan Athletic). Chris Burke (Birmingham City) wins a free kick on the right wing. Hand ball by Jordi Gómez (Wigan Athletic). Offside, Birmingham City. Darren Randolph tries a through ball, but Federico Macheda is caught offside.